For all the hype around tiny houses, far more people talk and read about them than live in them. We suspect if people were given the opportunity to live in one for a while, they might take the tiny plunge…or put a down payment on a McMansion. WeeCasa is a hotel that gives you that opportunity, offering up one of 10 tiny house “hotel rooms” that let you experience tiny house living firsthand. Weecasa is located in Lyons, Colorado, a small town an hour north of Denver in the foothills of the Front Range. Unlike Caravan Tiny House Hotel in downtown Portland, which has been around for a few years, Weecasa has a more pastoral vibe. The tiny houses are nestled into the trees and sit next to the St Vrain River. Lyons has a ton of things to do such as festivals, outdoor activities and is a quick, albeit uphill, drive to Rocky Mountain National Park. 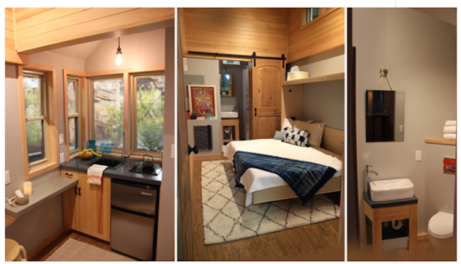 The houses are built by a number of different tiny house manufacturers, and only one exceeds 200 sq ft. They are quite handsome and outfitted like tiny houses you could live in, replete with kitchenettes and bathrooms. In fact, WeeCasa is as much showroom as hotel. If you like the one you stay in–or perhaps a neighbor’s model–WeeCasa will help you buy one, or one just like it. Rooms run start at $139/night. Visit their website for more information. Two great ideas in one! Great Hotel Concept that let’s potential tiny living wannabees experience tiny living before making the leap! Life Edited leaves me encouraged, inspired, and educated! Winning Combo David! “they might take the tiny plunge…or put a down payment on a McMansion” There are other options. After empty nesting, I went from 2600 sqft to 1600. That was still a huge change with good will and many Craig’s List readers benefiting. I’m a maker and I have a wood/metal shop that is larger than most tiny houses you show. My mostly recycled wood storage is 200 sq ft. and I have a large garden that requires tool and food storage. I read your site for ideas of space saving things to make to eek out the most of my space. And I take issue with being told that if I’m not plunging into 200 sqft I’m in a McMansion. I doubt I’m that far off center of the bell curve of your readers. I guess most guests of this hotel won’t be future McMansion owners, anyway. But I agree with you. I’m a luthier, and while I can live in a tiny house I need space for a shop with two different requirements: a “dirty” place where most of the sawdust and finishing work takes place, and a “clean” one where setup, testing and client’s meetings can be made. it’s a joke dave. i personally think tiny houses are pretty impractical for most (but not all) humans. as you say, most people find their sweet spot somewhere in the middle. I think what may be practical for many people is a return to the commune style of sharing common space but having your own private space too. Yea, I’m a 60s vintage. Despite how fun it may sound, you can be in a commune without all sharing the same bed. I envision a collection of tiny house personal spaces around a central shared communal atrium space. There could also be a common cooking facility so that not everyone needs an oven large enough for a 20lb turkey but could have access to one. And take that further, there are many shared maker spaces cropping up, why not some of the tiny houses surrounding the common set up for specific tasks like wood working or sewing. For the amount of time I spend in my shop, as essential it is, I could easily share it with two or three others with just a little more diligence in cleaning up after each session, not a bad practice anyway. And same goes for a shared garden, even adding a few extra of popular hand tools you don’t really need a bigger tool shed. The tool shed size is really defined by the few but easily shared larger ones. And you are likely to learn something from each other. City living? Stack them up for a tower of communes, each with a different focus. I might like the garden commune and you the music commune with shared instruments and a communal grand piano that would never fit in a tiny house (but might be converted into one). Um, Murphy Piano? Wait, where was I going with this? more than that, the residents develop the building, so they could easily add amenities that cater to their needs. Great links, I like it. thanks. Kind of reminded me of collage dorms. Extreme upscale versions granted, but something triggered the memory. I also like the idea of communal library. I don’t like the e-version of reference books. Maybe if they had better natural language search, easier to use book marks and tagging features. And if there was a note pad feature that allowed links to book pages, it might win me over.. I just want it all my way, you know. oh wait, we were talking about communal living……. I get easily distracted by my own imagination wandering.off. There is a name for that and a pill too I’m sure.